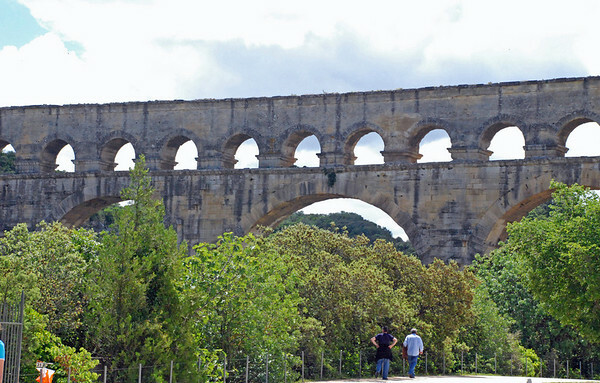 The Romans built a 31-mile system of canals to bring water from springs near Uzes to the new town of Nimes, where they built the Arena and the Maison Caree, the latter a remnant of a temple built for Apollo between 3 and 5 AD. 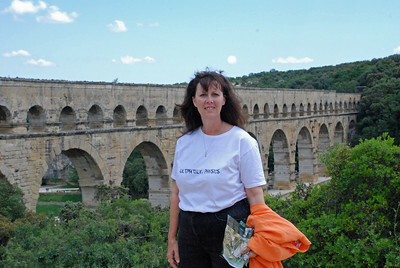 The Pont du Gard is a 900-foot long, 158-foot tall aqueduct built across the River Gard, completed probably during the reign of Emperor Claudius (41-54 AD). 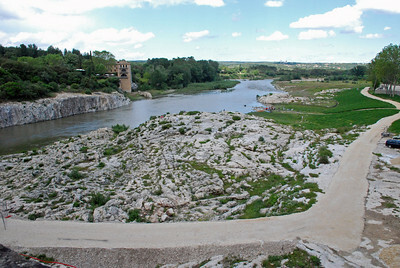 At one time, it carried nine million gallons per day into Nimes. The Romans themselves considered it the best testimony of their empire. 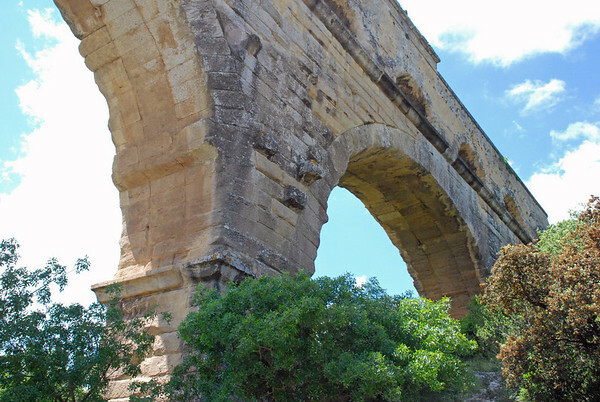 However, it was difficult to maintain, and the Romans employed cleaners to crawl through the aqueduct, cleaning debris and trimming the roots of plants that embedded themselves into the seams between the stones. By the 4th century, the mineral-laden water contributed to the scale and debris that plugged up, and the network of canals into complete disuse after the collapse of the empire, being completely abandoned by the 6th century. 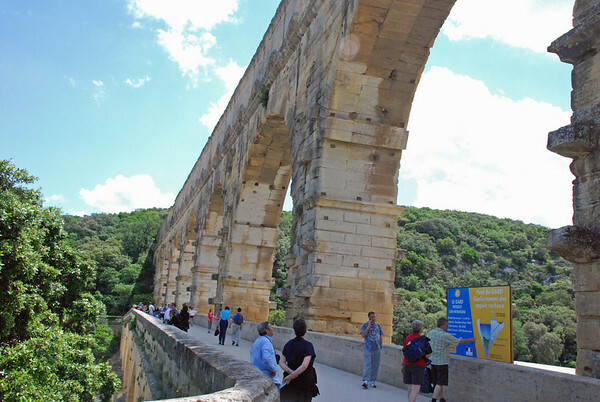 However, the aqueduct itself was used as a bridge, with the Bishop of Uzes collecting tolls, armies using it for thoroughfares, and indeed, public traffic continued on the structure as late as the 1990s. We saw a short interpretive film (short on engineering, long on romance) which showed close-ups of dates, numbers, names, and pictures that the slaves and soldiers had carved into the massive stone blocks. The bottom level of the bridge was used for a thoroughfare for over a thousand years. Used for car traffic until 1990! 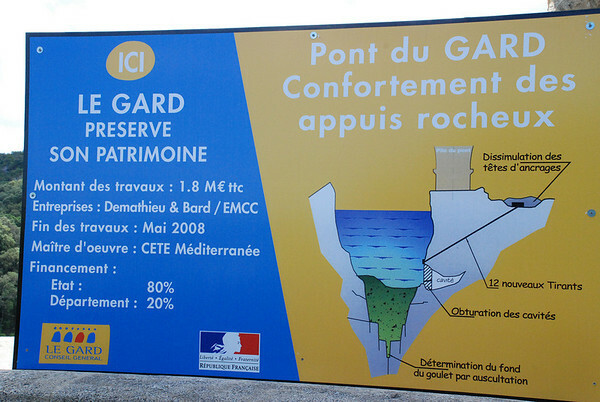 One of the photos shows a marker explaining the preservation work that will be conducted shortly, to shore up the bedrock and foundations where centuries of river action are undermining the structure and threatening collapse. Prior to 2000, car traffic and even food and souvenir stalls littered the banks and surrounding area. One side note: The French haven’t been to disposed to put languages other than their own into their museums and monuments. The museum at the Pont du Gard was destroyed in a massive flood in 2002, and the new center has been rebuilt to cater to visitors from all over the world, with translations available in the film, the signage, and the gift shop items. 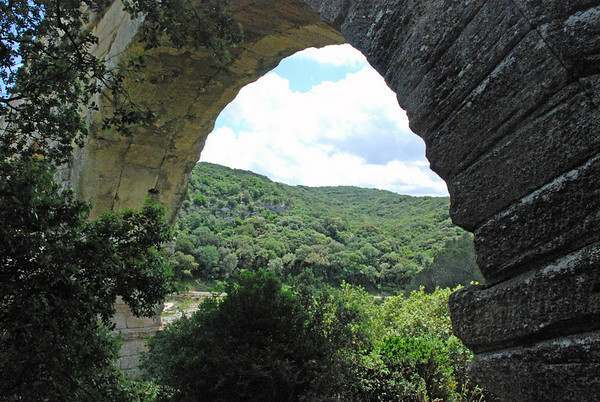 This site is one of France’s most popular attractions, and is on the UNESCO World Heritage List.